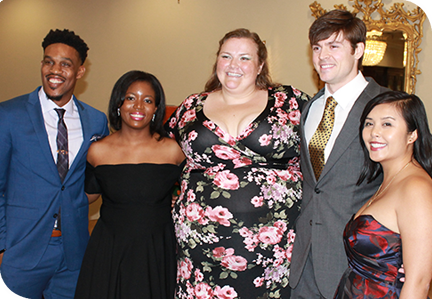 Albany, Ga. – The Phoebe Family Medicine Residency Program (PFMR) celebrated the graduation of the Class of 2018 on Saturday evening during a ceremony at Doublegate Country Club in Albany. This year’s graduates are: Antwuan Allen, MD, Shayla Curtis, MD, Daniel Smith, MD, Gary Clay, Jr., MD, Kristen Krakovec, MD, and Kim Ann Dang, MD. “The graduation ceremony celebrates the successes of these graduates and the hard work they have put in over the last three years. I am proud of each one of them and all they have accomplished. Whether they are staying in Georgia or going to a neighboring state, they will greatly benefit their community by providing the highest quality of care to their patients,” said Dr. George Fredrick, program director, Phoebe Family Medicine Residency Program. Three of the graduates will practice in Georgia. Right away, Dr. Clay is staying in Albany and will be practicing as a hospitalist for Phoebe starting this month. Dr. Allen will be practicing in Columbus, Ga., and Dr. Curtis in Fitzgerald, Ga. Dr. Smith will also be returning to Albany to practice next year following a sports medicine fellowship. Dr. Krakovec will be practicing in Crawfordville, Fl., and Dr. Dang is beginning a palliative care fellowship in Macon, Ga.
Several awards were given at the ceremony. Shayla Curtis, MD, was named Resident of the Year and Peggy Bergrab, MD, was named Residency Teacher of the Year. Clay Hartley, MD, was named Intern of the Year and Sharmon Osae, PharmaD, was honored with the Community Faculty of the Year. Muffadal Kheda, MD, was awarded the In-Patient Faculty of the Year, and the Advance Practice Provider of the Year of awarded to Gregory Steele, FNP. The PFMR’s primary mission is to train family physicians to practice in rural Southwest Georgia. This year’s class brings the total number of PFMR graduates to 120 since the program began in 1993. Seventy-two percent of those graduates are currently practicing in Georgia, and the majority of those remain in southwest Georgia. To learn more about the Family Medicine Residency Program, please visit www.fmresidency.com. PHOTO: Class of 2018 graduates pictured from left to right: Antwuan Allen, MD, Shayla Curtis, MD, Kristen Krakovec, MD, Daniel Smith, MD, and Kim Ann Dang, MD. Not pictured: Gary Clay, Jr., MD.